A nearby point is marked Carrignagower, height 2478 ft., on the 1924 6 map. Named Knocknalingady in Claude Wall's book Mountaineering in Ireland, from the nearby townland of Coolnalingady. Previously Knocknalingady in MV. Carrignagower is the second highest mountain in the Comeragh Mountains area and the 65th highest in Ireland. Carrignagower is the third highest point in county Waterford. 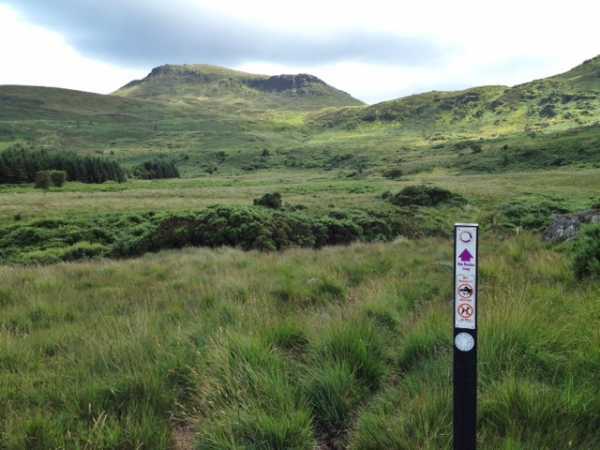 There is a handy trailhead at Curraheen (S30609 15447 A) with plenty of parking. You can follow the well marked trail up to the gap and straight up the track to Carrignagower, a climb of 600m. The little bridges they provide make the trek through the sometimes boggy valley much more pleasant.